Flagellation by Piero della Francesca c.1465, Urbino, Gallerie Nazionale delle Marche. Picture taken from an animation of a computer generated reconstruction of the geometry of The Flagellation produced by Antonio Criminisi and his team at the Robotics Dept. of Oxford University. If we are concerned to search for cardinal examples of the influence of art on science, perspective provides the most striking and readily demonstrable example. Following its invention by Brunelleschi, and its first codification in writing by Leon Battista Alberti in his little book On Painting in 1435, perspective rapidly became a stock-in-trade for any artist who wished to remain abreast of the latest techniques - initially in Italy, and subsequently across Europe. For many artists, perspective assumed the status of a convenient technique to establish the illusion of a space behind the surface of a picture. For a minority of theoretically-inclined artists it acted as a research tool through which the picture became an experimental field for the geometrical construction of illusions which might emulate the optical force of real space. Even more exceptionally, the mastery and use of optical rules could become an ethical imperative. 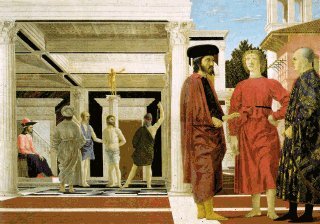 The greatest of such artists was the Renaissance painter, Piero della Francesca. 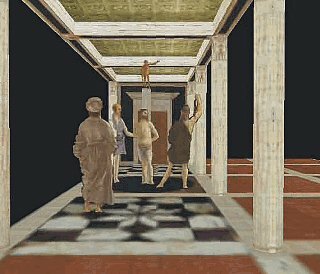 Even a quick inspection of his relatively small painting of 'The Flagellation' will reveal the meticulous construction of an exceptionally deep platform for the ‘actors’, passing back from the zone in which three figures debate the nature of Christ’s torment, as disclosed in the middle ground, to a distant piazza. Careful analysis, either by hand or by computer, reveals the extremes to which he went to comply with mathematical rigour. For example, the complex tile pattern within the loggia is projected with scrupulous precision, and is founded upon a series of related squares, the larger of which have side lengths equal to the diagonal of the smaller. Exceptionally for an artist, Piero was the author of books on practical mathematics and the geometry of the five regular polyhedra, as well as 'The Perspective of Painting'. His treatise on perspective shows how to plot the outlines of forms systematically onto a foreshortened plane, and how to use the plan and elevation of solid bodies to project them laboriously point-by-point on to an intersecting plane from a fixed viewpoint. We know that he followed such meticulous procedures in wall paintings even when the effects were too far from the spectator to be appreciated. Getting things right was integral to Piero's contract with God’s design of nature. Text taken from 'Piero's Perspective' by Martin Kemp.